Note: when spraying Liquidseal, the use of gloves and a mask is recommended. Wearing an apron will prevent clothing from becoming soiled. No mask is necessary when dipping fruit, as Liquidseal is not volatile. Use of a mask is recommended during spraying; a high concentration of Liquidseal may build up in spaces that are poorly/inadequately ventilated. Will the flowers be hermetically sealed? 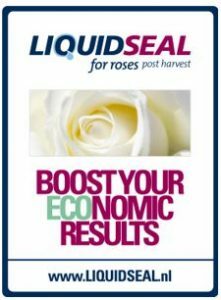 No, Liquidseal affects the evaporation of moisture from the flowers: this would be impossible if the flowers were to be hermetically sealed. Can a fungicide be added to Liquidseal? Yes, that’s possible. If the fungicide is added to Liquidseal the fungicide is retained its activity longer. In which ratio fungicide can be added to Liquidseal? In the same ratio as that the fungicide is mixed into water. Our product can best be compared to packaging applied around the flower. When stored as recommended, our products have a shelf life of two years. Our head quarter is located in Leiden – the Netherlands. Worldwide we work with representatives and distributors in Spain, South America (Ecuador, Colombia, Mexico) and Kenya. Please be in contact with your local representative or distributor which are to find on our website under the chapter ‘Contact’. Orders can be placed via our website (www.liquidseal.nl) or by e-mailing us at info@liquidseal.nl.